I went to see Northern Limit Line (연평해전) with a friend last weekend, and I was caught off-guard that a new release shown in Korean with subtitles would be at a theater near my apartment in suburban Dallas. It’s military drama about a North Korean attack on a South Korean naval patrol boat during the 2002 World cup. Without any of the art-house appeal of most Korean movies that make it to the states, I figured it just be my friend, me, and a few other people who’d put up with seeing a movie with subtitles. Imagine my surprise when we walk into the 100-some seat theater to find just about every seat taken. I came in figuring I’d have an enjoyable, light evening with a friend, but the experience of watching a deeply political Korean movie among Korean people brought on feelings of sadness I haven’t felt in ages. I won’t comment very much on the movie; it’s a very straightforward war thriller. A new transfer, Park Dong-hyuk joins the Chamsuri 357 crew, and you meet the crew he’ll call family during his assignment, get some humanizing insight into their backgrounds and families, and then witness them under attack in a prolonged series of intense battle scenes. It’s that combination of humanizing goofiness juxtaposed with heavy-handed melodrama that Korean films are known for, and it was pretty good. The plot wasn’t particularly unique or compelling, but I enjoyed the film for what it was, and its grounding in real-life events made for an entertaining dramatization. However, more than the film itself, the act of watching it was a very sensorily powerful experience for me. The context of watching a movie about the conflict between North and South Korea with other Korean people was more compelling than the film itself, and the somber mood in the theater was palpable. My focus shifted to the Korean people around me, and I began to reflect on how my experiences as an adoptee have often left me feeling isolated. I’ve never felt like an American; I’ve always felt like myself, divorced from any attachment to a nationality. Some of that must be associated with my personality type, but I often think about how much of this feeling comes from how I’ve been received by other, mostly white, Americans. The incessant racist bullying as a kid has evolved into tacit condescension and inept compliments about my English proficiency as an adult. Any time I’ve felt loved, validated, appreciated, and a part of something larger than myself, it’s never been in the context of being an American. I have never once felt compelled to put my hand on my heart when the national anthem is played in public spaces. The only time I feel like an American is when I am overseas and the conversation turns to where I’m from based on how I speak. However, any time I’m in the company of non-Americans, I’m often self-conscious of how little of the world I’ve seen and how I can barely speak more than one language. But I haven’t felt very Korean either. Koreans are a very proud and nationalistic people, and after occupation, war, and a meteoric economic rise, that collective identity is well-warranted. There’s a thread of tough-hearted resilience running through the Korean consciousness I truly admire. However, this nationalism and a Confucian cultural framework leaves little room for me and other adoptees who fall outside of societal norms. My very existence as an adoptee is a reminder of national shame, of a misguided attempt to solve widespread social issues with rushed policy that focuses more on idealized platitudes than addressing the challenge of substantively elevating all citizens. For as much as I’ve pursued Korean language study, learned about Korean history, associate with people of Korean ancestry, and even look Korean, it’s never enough. It’s tiring to have your humanity and existence perplex your own people. Whenever I meet new Korean people, they often don’t know how to handle me, and have trouble comprehending how much effort I’ve been put into ‘being Korean’ in my younger years. Yes, my intonation in “맥주 두 병 주세요” is off. And yes, if I like 족발, then I know more korean foods than 김치 and 비빔밥. I don’t expect praise, and frankly that’s not what I’m looking for, but I don’t like being naively patronized and having my lack of expertise nitpicked either. I’m too old, lightheartedly disgruntled, and focused on my own joy to seek the approval of people who aren’t equipped to understand me. 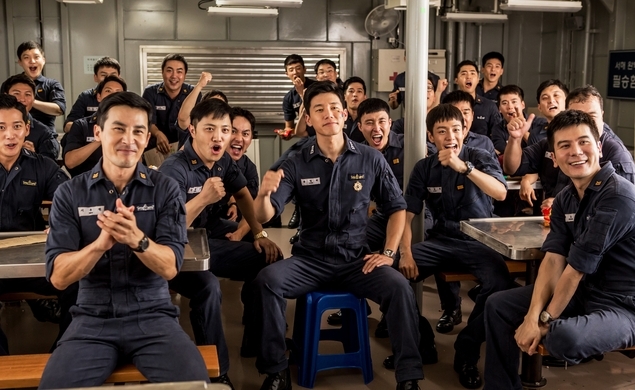 Despite that, watching Northern Limit Line and witnessing the camaraderie of Korean navy recruits slapping each other’s asses, sneaking out to eat noodles in the dark, and sucked into the excitement of the Seoul World Cup brought upon a sadness in me that I haven’t felt in a while. I have amazing circles of friends, but I can’t stand social environments where being a part of a broad majority is a prerequisite to being comfortable. I can’t experience a camaraderie that feels like this movie. I can’t feel this way with broad crowds of people. My most profound experiences relate to the pain of feeling alone, and the sheer ecstasy and validation of finding those who ‘get me.’ I imagine that if my background, upbringing, and life trajectory lined up more closely with average white americans or Koreans, people would be more interested in me as an individual, and I’d feel an attachment to a larger national identity or consciousness. And when I saw Korean viewers on the edge of their seats during the movie, at times gasping, at times holding back tears, I felt a profound sadness in lacking a broad identification with being part of a nation. A nation of people who eat the same food, speak the same language, share the same history, and have similar reference points for what’s going on in each others’ lives, where conversation can come naturally without any posturing, prefacing, or contextualization. I want to be able to say that I went to my Aunt’s for 추석 and that I went to 명동 to eat 짜장면 on Black Day. At times like this, I feel like my experiences immersed in white America have been a waste, and I want nothing more than to be ordinary and to have a mundane life. Now that I’ve been thoroughly enculturated and my personality is well-formed, I can’t go back and experience ‘Korean-ness’ as a malleable child, and I feel a profound sense of loss. I feel like I’ve missed out on opportunities to bond with others in simple, straightforward, but deeply fundamental, inexplicable ways. Everything about myself needs to be explained, because it can’t be captured in a word. And what I felt most powerfully in the theater was that I do not have any way to identify with my ‘own people’ in a clean, black-and-white way. In my everyday life, I’m ambivalently walking a tightrope teetering between despair and fulfillment, and I’m generally inclined to fall toward the latter. However, when I find myself in situations where others feel a powerful, transcendent bond to a cultural continuity and shared consciousness through nationalism, I feel a hazy, ambiguous void that can’t be filled by my otherwise deeply gratifying, challenging set of experiences as a Korean adoptee in America. These days, the pain of uniqueness doesn’t sting as much as it used to. However, watching Northern Limit Line in a theater packed with Korean people conjured up bittersweet reflections on what could have been.